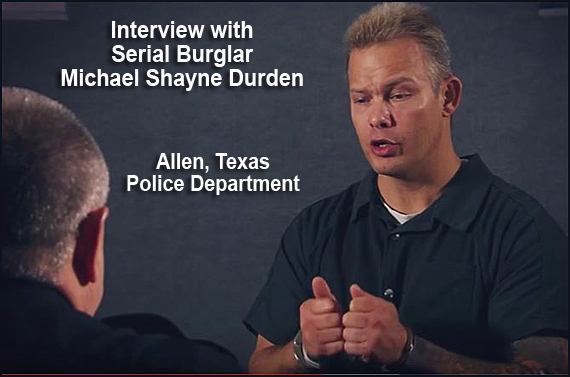 For over 20 years Michael Shayne Durden burglarized hundreds of homes across Collin and Dallas County. He has spent his life learning how to break into homes to find and steal thousands of dollars worth of possessions. He was getting away with it until the Allen Police Department in cooperation with the Plano Police Department caught him. He is facing 20 to 30 years in jail. Even though the serial burglar is remorseful, and provided valuable information in the interview, Durden will not receive a reduced sentence. Felty stated that Durden was on parole when he was caught, which adds time to his sentence. The ankle bracelet worn by the parolee was set for a 7pm curfew. Durden used that opportunity to commit burglaries during daylight hours. Since the interview was published, the Allen Police Department has received calls from police agencies all over the country asking to use the video for training and for local PSA distribution. The video has had over 38,000 views on YouTube.